Here is an upcoming event that I am involved with. It is the "HOT August Nights" Concert, Dance and Show Car Cruise Night. 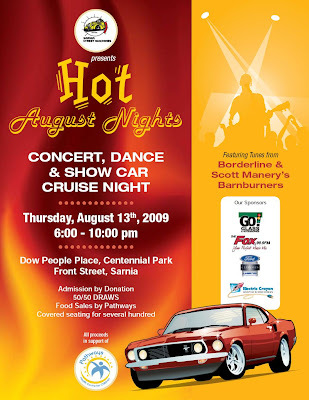 Thursday, August 13th, 2009 at the Dow People Place - Centennial Park, Sarnia, ON. The show will run 6:00pm to 10:00pm. Featuring the music of "Borderline" and "Scott Manery & the Barnburners". Admission is by donation with all proceeds in support of Pathways. Food sales will be by Pathways and there will be 50/50 draws throughout the evening. Personally, I am involved with mixing the live sound for the bands during the concerts. I invite everyone to come down to the Dow People Place for a great evening of entertainment and to also donate your money to a great cause. Labels: Borderline, Centennial Park, concerts, dance, Dow People Place, Hot August Nights, Pathways, Scott Manery and the Barnburners, show car cruise night.